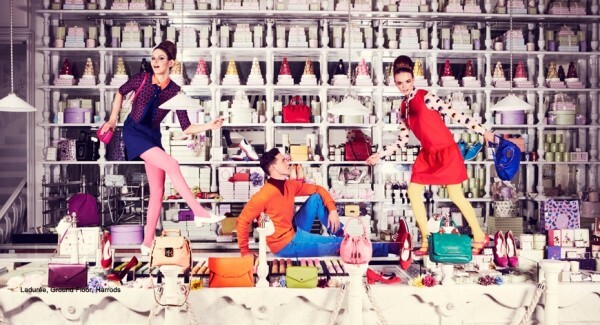 How wonderful is this advertising campaign from Harrods? Photos were taken in all of Harrods' eateries and cafes. I love dramatic staged photos that relay a certain innocence and overindulgence for sure. How about that cheetah cake? If I had been one of those models I probably would have gained a few pounds during the photo shoot. Laduree macaroons? yes please! Freaking larve it!! So va va voom!!! So wildly over the top! Love it. And super clever. Some of the best foods can be found at department stores i.e. the cafe at Nordstroms has some of the best food ever. Lines wrap around the store to get a table at that place. I'm pretty sure Harrod's can boast as much. TGIF chica! Enjoy the long weekend. All lovely - I just can't resist cakes and even better when presented on the tiered stand! The cheetah cake is so creative! Whoa. I kind of love it! Embarrassing but funny -- when I was in London with a high school group, there was limited time and too much to do. The group went to the Tower of London, but two of my friends and I went to Harrod's instead. I'm such a sucker for high fashion spreads. LOVE this. LOVE this spread! This is so my aesthetic- glam, feminine, and colorful. Wow, so colorful and yummy yummy! I love Harrod's, it's one of my favorite store when I go to London and the Ladurée stall is really gorgeous! How fun would it have been to style those shoots? Love it!